There are now two concurrent definitions for the term “operators” in the context of Red Hat’s container infrastructure: Obviously, there is the body of users who specialize in the deployment and maintenance of developed software — the “Ops” part of the portmanteau “DevOps.” Then there is the emerging concept of an “operator” for Kubernetes: a component that automates the deployment of an application being managed by, or connected to, a Kubernetes cluster. The latter is a type of automation for applications or other components, such as a Cassandra database, that the Kubernetes orchestrator would seek to manage — a kind of “instruction manual” that opens up those components to instruction from, for example, the kubectl command line tool. It’s a system that CoreOS released in late 2016, and which it was preparing to formalize as the Operator Framework until Red Hat’s acquisition of CoreOS last February. The operator is one outgrowth of one of CoreOS’ automation system for Tectonic. Another was an under-the-hood, over-the-air (OTA) automation system capable of zero-click live updating of the Kubernetes core of its Tectonic commercial platform. That’s the part that CoreOS CTO Brandon Philips boasted back in 2015 separated the entire CoreOS platform from OpenShift and its other competition. Now that the CoreOS development team has been welded into the Red Hat organizational chart, as Red Hat OpenShift product strategy director Brian Gracely told The New Stack, it’s Philips who officially wins the arm-wrestling match. The OTA updates from Tectonic will replace the Ansible-based system in future editions of OpenShift. “First and foremost, the Tectonic console was built to be Kubernetes-aware,” admitted Gracely. “Whereas, when we adapted other tools in the past, they would understand certain Kubernetes concepts, but sometimes it wasn’t as granular as maybe you needed. ‘Is my cluster up and running?’ Yes. Second-, third-level health checks of what’s really going on in that cluster, how well are the nodes being managed, those types of things — you’re going to get more granularity out of what the Tectonic console provides you. In a press conference earlier this week at Red Hat Summit in San Francisco, Red Hat’s vice president and general manager for OpenShift, Ashesh Badani, told reporters that OpenShift users should expect to see Tectonic’s OTA system appearing in their platform fairly shortly. The operator technology remains under active development, as former CoreOS CTO — now Red Hat engineer — Brandon Philips said. This will enable OpenShift, going forward, to access components that may be orchestrated by Kubernetes but not directly managed by it, and the difference is less-than-subtle once Philips explains what’s going on. With Amazon’s Relational Database Service (RDS), as one example, a user asking the system to spin up a Postgres database will trigger the instantiation of a VM behind the scenes, noted Philips. The Postgres database’s functionality becomes exposed through RDS’ native API. 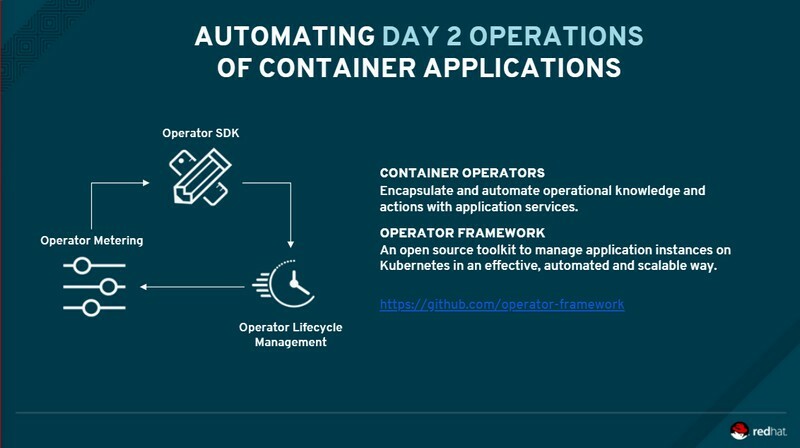 Operators will work similarly through OpenShift, enabling the functionality from the native API of the outside component to be accessible through Kubernetes’ control functions, including the command line. With Kubernetes new deployment model, Gracely added, the ability to spin up new nodes for itself — which the orchestrator originally lacked — has been added natively. So some of the functions Ansible had been providing through OpenShift had already become redundant anyway. Thus Ansible will be stepping aside specifically for functions that either the updated Kubernetes now performs better on its own, or that the Operator Framework can provide more directly. Conceivably, a revised Ansible playbook could trigger operators on a higher level, although the means for doing so may have yet to be determined. Some of Tectonic’s more operator-centric personality (the personal kind of operator, as in “DevOps”) will reveal itself in forthcoming editions of the OpenShift console, as dashboard and console elements tailored to the role of its user — specifically, whether she’s a developer or an operator. That seemed okay at first, he said, since operators (the human ones) tend to choose their own tools for themselves. Meanwhile, Tectonic was making inroads with Ops, and it appeared they were choosing Tectonic more and more for cluster management and for highly-customized deployments. 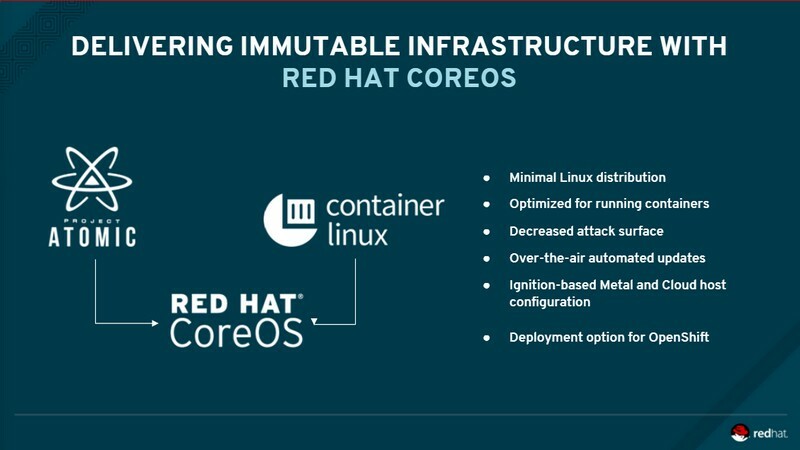 The container-based Linux that is emerging from the combination of CoreOS — the firm that arguably popularized the concept — and the Project Atomic company, will be called Red Hat CoreOS. This is where one of the brands that built the containerization industry will live on. But there was some concern from the moment the acquisition was announced about whose code would remain in the kernel. It’s not just a performance issue, but one that traverses the issues of automation and compliance as well. The keyword in Philips’ response was “similar.” At its core, it wasn’t really feasible for Container Linux to be adopted entirely, stated Brian Gracely. Red Hat’s Atomic team effectively slimmed down their kernel’s own footprint, and adopted the CoreOS methodology of integrating added-on functionality through additional containers, Gracely added. But Atomic was built on the Fedora/RHEL kernel, which ISVs have already certified for use with their applications. Red Hat simply could not swap out one OS kernel for another, and have their certifications mean the same thing. It would be like signing a treaty, declaring the treaty invalid, and then asserting the treaty could be renegotiated with all the other parties. In other words, ridiculous. Although the key bounty in Red Hat’s acquisition of CoreOS may have been its talented engineers, as I’ve said before, easily the second item on Red Hat’s list was its automation. 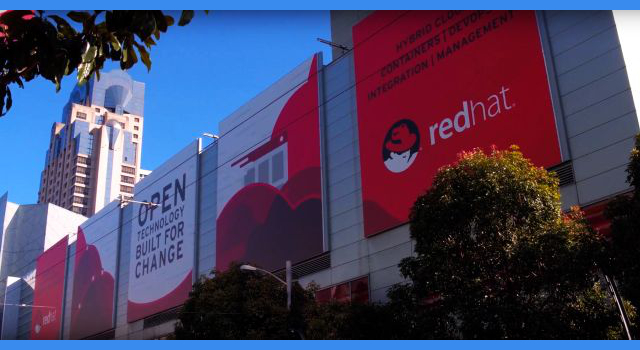 Attendees of Red Hat Summit were alerted to expect the first CoreOS-merged releases of OpenShift this July.